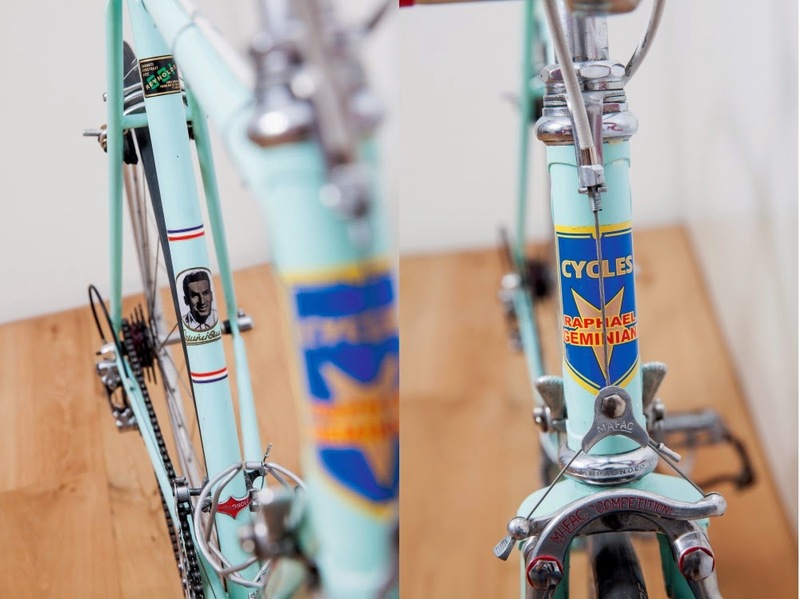 "lovingly restored so it’s almost exactly like the one he rode in 1959. The restoration means it looks as fresh as it did in 1959, too." Upon closer inspection there are a few items that are off by a couple years and one part is glaringly incorrect on this restoration. I will preface this critique by saying it is very difficult to do a complete restoration, from stem to stern. Parts are difficult to source and knowing exactly what is correct and what is passable can sometimes be subjective. I tried to stick to just the facts, well the parts. Paint color and finish can be very subjective. And yes, I know it is easier to critique a work of art than create one, this is professional critique, not personal. 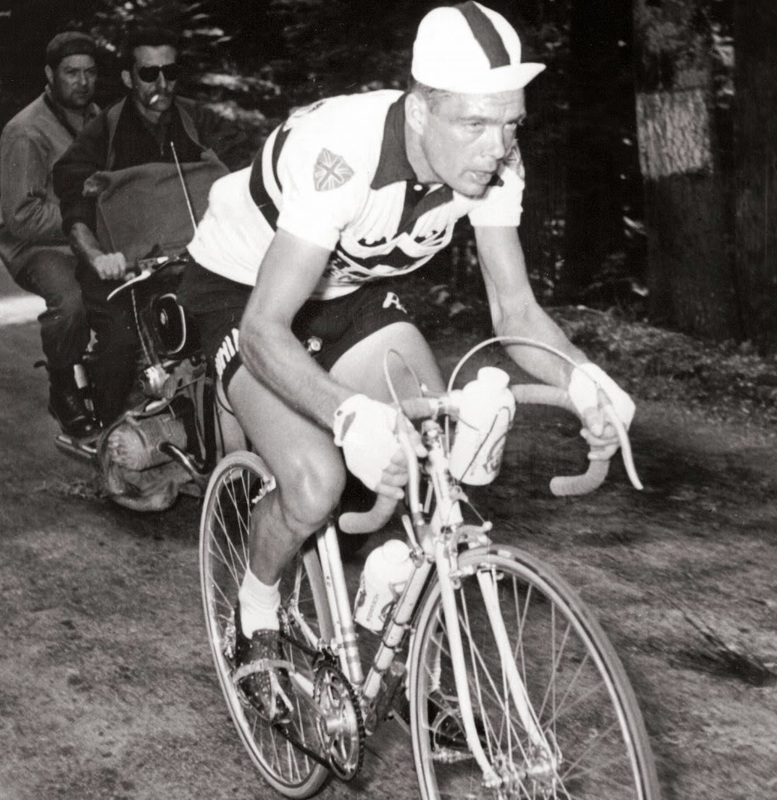 I first noticed the Mafac Competition brakes, that were a product of the mid 1960s, and examining the photo of Brian Robinson riding, one can see they appear to be Mafac Dural Forged brakes. I also noticed the Campagnolo headset is a mix of various models- the adjustable cup is 1960s-1970s Gran Sport, whereas the lower cup is Record/Nuovo Record. I won't be as critical to comment on cable ferrules or cable end caps. . . It is a cool downtube waterbottle cage, I don't understand how the one clamp at the top of the cage supports the cage from moving or coming off. 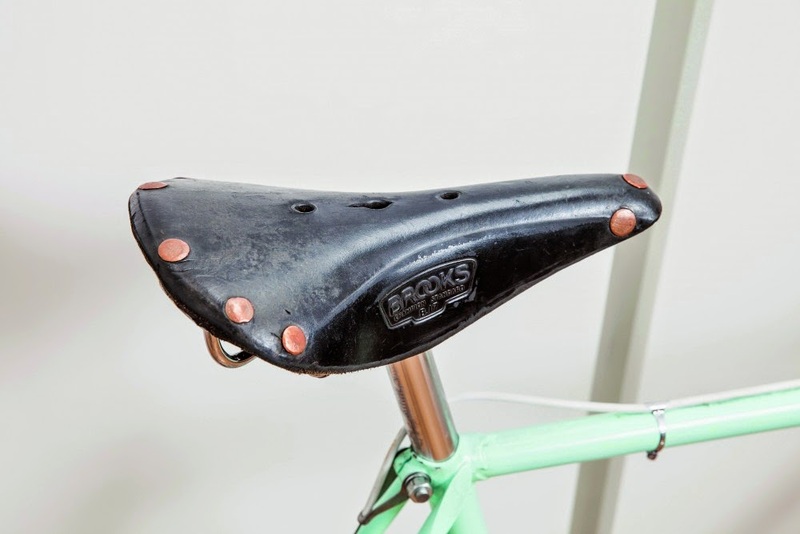 Modified Brooks saddle, article mentioned Otussi, but there is no common Otussi stamp found on one of the large rivets. The shifters are from the 1970s- looking at the logo on the band and the hardware with the shifters is newer as well. The original, late 1950s shifters, would have used a screw head rather than the later D screws. The logo on the shifters could have also included the "open -C" Campagnolo stamping, but that is a grey area. 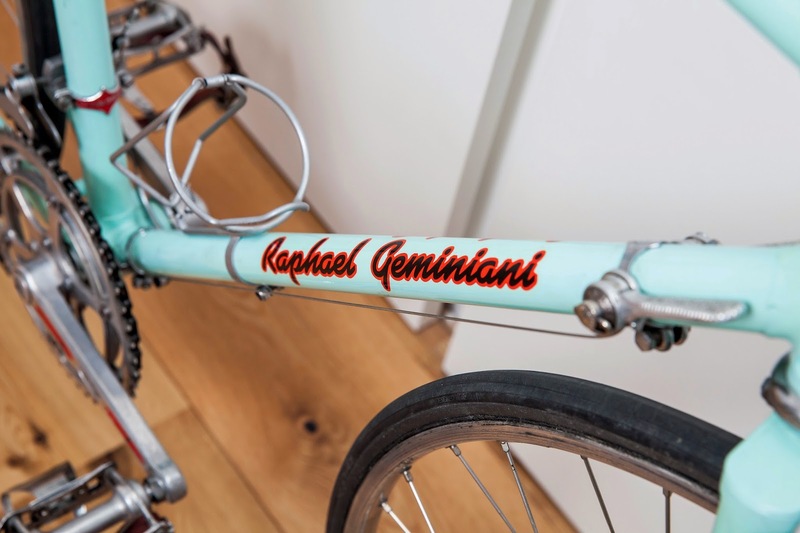 In the late 1950s, Campagnolo was phasing out the open-C stamping, but some bikes in the 1960s were found new with them. The handlebar stem is wrong. It is 1980s-1990s. 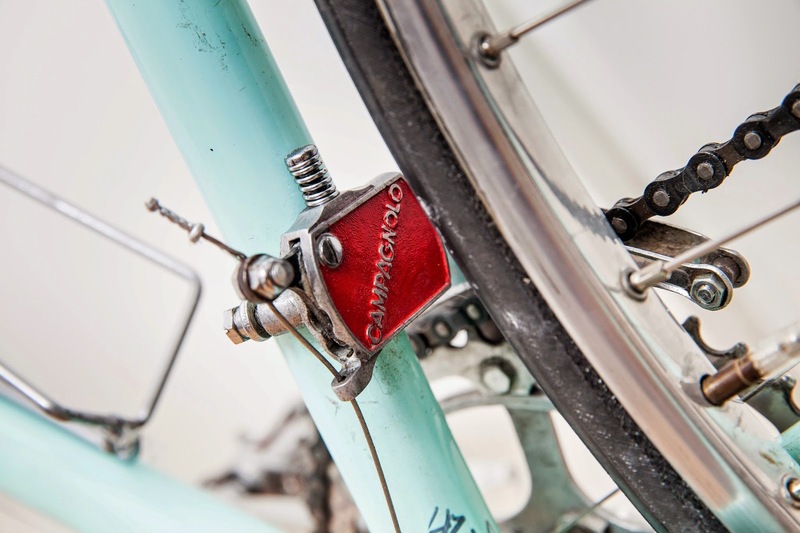 The photo, with the caption "Tullio Campagnolo invented the quick release back in 1930, and they’ve changed little since," shows a 1990s-2000s SHIMANO quick release skewer. 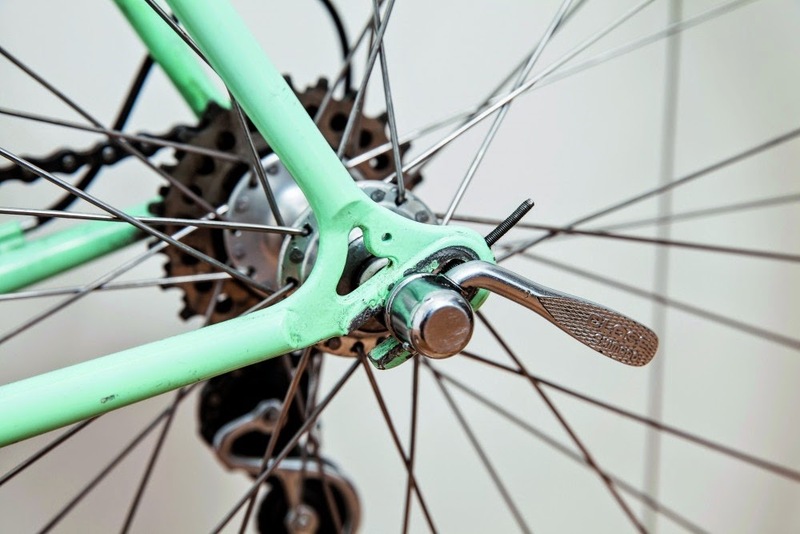 It is Gran Sport front derailleur, not a later Valentino, but you are correct about the incorrect downtube cable guide/stop that would have utilized a short piece of cable housing. 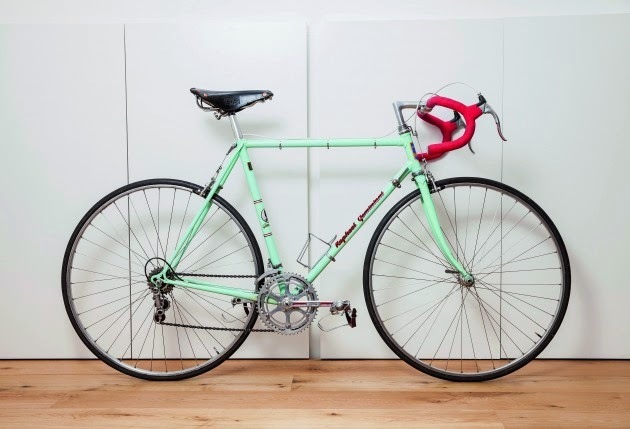 308I'm an oldish lifer bike mechanic who has been riding since you could walk into a bike store and buy a brand new Geminiani and I've got a few observations: Fork--the crown is NOT a period item; my guess is that a new fork was built sometime. Rear dropouts are French Satri (someimes these were sold as Mavic) and date from the early 70's. I caught the cork tape and Mafac Competitions too as well as the post-GranSport derailleur cable guide. As a professional bicycle restorer and mechanic, I must point out that one's interest is "piqued," not "peaked." With regard to the bike itself, it's a pretty thing, but there is precious little (if any) period-correct 1959 anything on it. 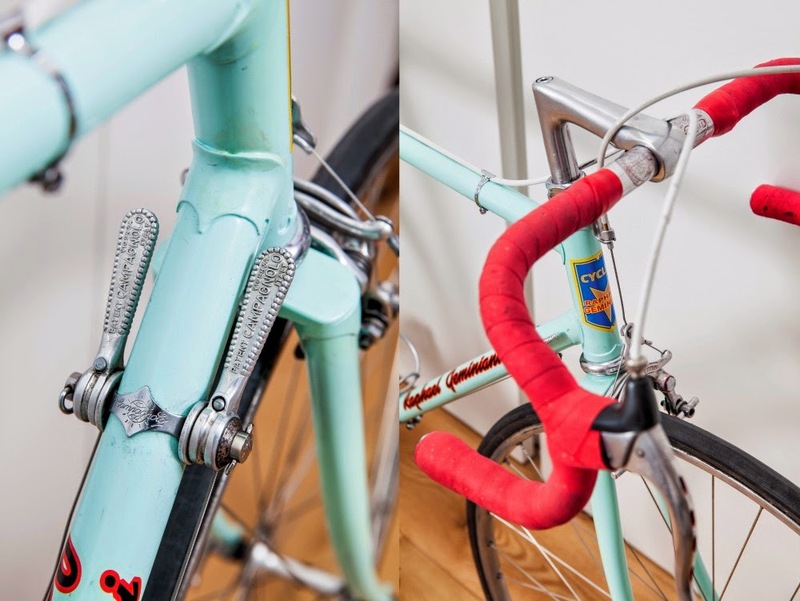 The handlebar taping around the brake levers is awful, and 2X spoking is just plain wrong. Super classy Drillium Colnago Pista "Hour Record"
Random drawer of mostly empty campy boxes. Happy Birthday to our founder Curtis Anthony! Philly Bike Expo this weekend!